The miracle of Christmas. I keep hearing those words this Christmas season. I have been thinking about them often. Wondering what they mean to different people. What do they mean to me? When I think of the Christmas story I wonder if the people there that first Christmas night thought they were witnessing a miracle. They had been waiting so many years for a messiah, a savior. They were expecting him to come riding in and save the day. They weren't expecting a helpless baby born in a humble stable to poor, young parents. Did they see it for the miracle that it was? I can see it because I see the big picture. I am looking at it 2,000 years later so I know the end of the story. I somehow doubt that they could truly understand the miracle of Christmas. Even if they believed, it was probably beyond their comprehension. What about today? Do we still believe in miracles? Or are they only stories from the Bible or things that happen to other people, not us? I have been thinking about this lately because we are praying so hard for a little boy, Michael, who desperately needs a miracle. I am praying for that miracle, but do I truly believe in miracles? To be honest, if you had asked me several years ago I probably would have said no. Even though I was a Christian and believed that He is fully capable to do anything He chooses, I saw very little evidence of miracles in my own life. Or so I thought. When my daughter, Emma, was born I prayed for a miracle. I prayed that she would be healed. I prayed that God would choose to do a miracle in her life. As time went on, I stopped praying for her healing. I just wanted her to LIVE. When she was taken from me to go to Heaven, I was so shaken. It took some time until I could look back at her life and see the miracle that had happened. She had beat the odds and lived for nine years. She had touched so many lives. On the day she went home to Heaven she was healed! Looking back, I could see that I had been given a miracle. It wasn't the miracle I had asked for but it was truly a miracle. Two years ago, when we were drowning in paper work to adopt Anna Grace, I again started praying for a miracle. We had received the news that adoptions from Vietnam were in jeopardy of being stopped completely and my heart was broken at the thought of not being able to bring Anna home. This time God did give me the miracle I prayed for. Anna joined our family two months before Vietnam was closed. Miracles. They still happen. Sometimes they are exactly the miracle we pray for and other times it is something different, but a miracle still. I have to have the faith that the God who knows me better than I know myself has a reason for the ways He works. I have to believe that His ways are higher than mine. I have to believe that His ways are best. This Christmas I pray for Michael. I pray with all my heart that he and his family receive exactly the Christmas miracle they have been praying for and he is healed. But I know that even if it doesn't happen exactly that way, God is still working and I pray we see the miracle He chooses to do in Michael's life. 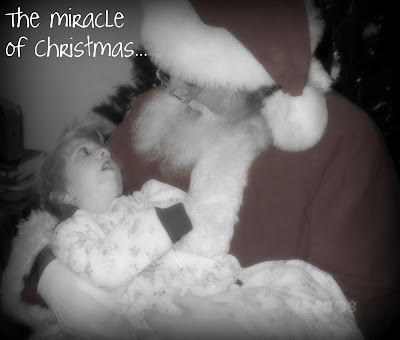 This Christmas I pray we all see the miracles around us. The ones we ask for and the ones we don't. This Christmas I pray we all see the miracle of Christmas. I pray our eyes are opened to the miracle of that helpless baby born in a humble stable to poor, young parents who grew to be a homeless traveler with a band of ragtag followers. It may not look like a miracle but when we open our hearts and see the God who became man to die on that cross in our place, how can we not know that Christmas is truly a miracle! Every day spent free from the guilt of sin is our Christmas gift. And THAT is a Christmas miracle!